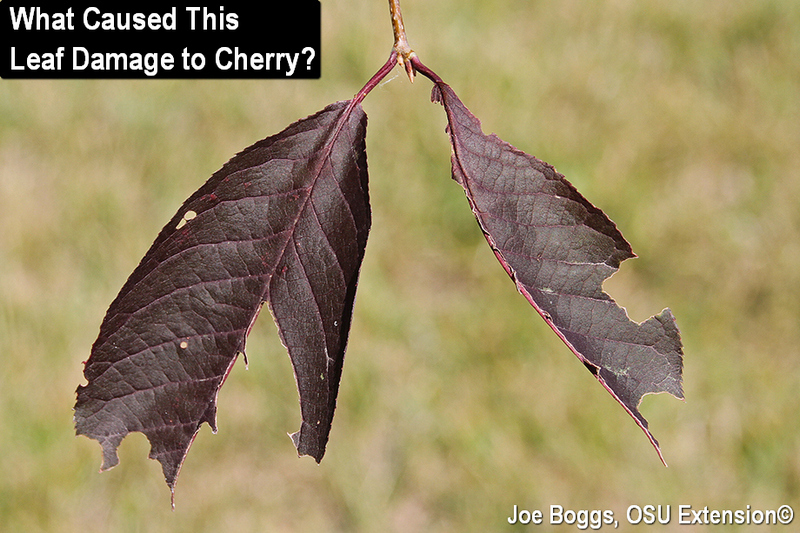 It's often impossible to identify the insect culprit responsible for causing holes or jagged margins on tree leaves if the perpetrator has left the scene. Unless there is a clear association between the tree species and a pest, we rely on dubious "it could be" speculation to solve a bit-and-run. The challenge is that any insect that uses chewing mouthparts with their scissors-like shearing action to feed on tree leaves must be considered. The list could include caterpillars, sawfly larvae, beetle adults and larvae, as well as some oddballs like grasshoppers and walking sticks. Then there's the matter of timing. Is it lingering damage that occurred early in the season, or did it happen recently? Sometimes the leaf damage can literally happen overnight. As my wife and I watched a pre-Fourth of July neighborhood fireworks display Saturday at twilight's last gleaming, I kept hearing buzzing around our cherry tree. In the rockets' red glare, the bombs bursting in air, I said to her, "O say can you see from the leaves of our cherry tree beetles gallantly streaming?" The beetles were Southern Masked Chafers (Cyclocephala lurida). Northern Masked Chafers (C. borealis) were on the wing a few weeks ago [see BYGL Alert, "Masked Chafers and Japanese Beetles are on the Wing," June 14]. Both of these night flying scarab beetles (family Scarabaeidae) love to buzz-bomb porch lights. The white grubs (larvae) of both chafers feed similarly to Japanese beetle (Popillia japonica). In fact, chafers have been the dominant white grubs damaging turfgrass in recent years in southwest Ohio. However, chafer adult beetles do not feed like Japanese beetles. First, the chafers only feed at night with the females producing the majority of the damage; they eat while mating. Second, they produce holes, notches, and jagged edges in tree leaves that look like damage produced by many other leaf-feeding insects with chewing mouthparts. Finally, chafers rarely cause significant leaf damage; however, the symptoms can present a diagnostic challenge in daylight. The literature does a poor job with providing information on trees targeted by chafer adults. Many sources say the adults do not feed; however, other sources indicate the beetles may feed on oaks, maples, and fruit trees. How do I know chafers caused the damage to my cherry tree that's shown in my pictures? Because I flagged the twigs with beetles which gave proof through the night the damaged leaves could be found in dawn's early light.